Band says making the record was "painful"
Fall Out Boy are still putting the finishing touches on their upcoming, heavily political album Folie A Deux, but a new single, I Don't Care, has already emerged, and MusicRadar has it. A relatively simple (for them) Gary Glitter-esque stomper with a delightfully snarky chorus ("I don't care what you think, as long as it's about me"), I Don't Care is the most straight-ahead rocker Fall Out Boy have ever done, and it's a clear indication that the band have abandoned their kitchen-sink approach to arrangements and are going for the throat. Working with longtime FOB producer Neal Avron, the Chicago quartet scaled back on the excessively multitracked sound of their last album, Infinity On High, which was helmed mainly by R&B producer Babyface. 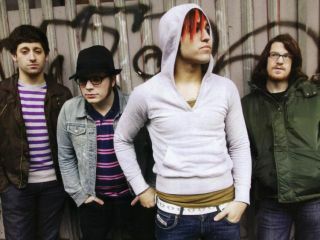 "This time, we focused on making an ambitious record without giving the impression of making an ambitious record," says bassist-lyricist and paparazzi magnet Pete Wentz. "Making this album was really painful," says singer-guitarist Patrick Stump. "Pete and I fought more than we have in a long time. I threw something over across the room over a major-to-minor progression." With the release date rapidly approaching (Nov 3 and 4 worldwide), the band are still nailing down their usual long song titles. But Wentz promises the CD will be ready for Election Day. "It's going to be one of the biggest days of the year," he says. "Why not be a part of it?" Check out Fall Out Boy's I Don't Care here.